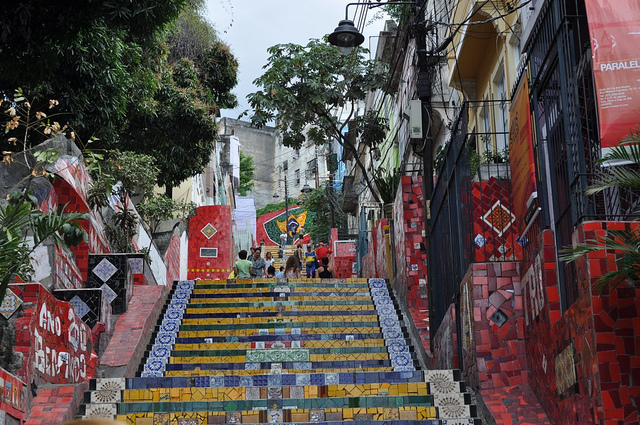 If you happen to be in Rio de Janeiro, make sure not to miss the neighborhoods of Santa Teresa and Lapa, but more importantly what connect them: the magic mosaic steps known as Escadaria Selarón (Selarón’s Staircase). The famous stairway, made up of 250 steps and measuring 125 meters long, is the stunning work of the Chilean born artist Jorge Selarón. After having journeyed to sixty different countries, Selarón decided to draw from his experiences to create this marvelous work of art next to his home in Rio where he decided to settle. Selarón used the tiles he collected along his journey to adorn the steps with over 2,000 brightly colored tiles from around the world. With its impressive size and beautiful bright colors, the stairway has been a main attraction for tourists from all over the globe who donate sometimes tiles from their homelands. After first appearing in a Fanta commercial around the year 2000, the stairs have since been on the pages of National Geographic, in music videos, documentaries, newspapers, and travel shows. Most recently they appeared in Rio’s beautiful 2016 Olympic video bid “The Passion Unites Us”.